ABSOLUTLEY!! Allow me to explain why I see an excellent opportunity to make profit in real estate by selling relatively soon. “pro business” president in the White House and has no qualms about showing their excitement. I believe that one of the primary reasons a Trump administration is so attractive to Wall Street is because of his $1 Trillion/10 Year Infrastructure plan that he has said he would like to implement in his first 100 days in office. Creating jobs, rebuilding roads, bridges, tunnels, hospitals, etc. before it becomes more expensive to do so, and infusing that capital into the economy by using American based companies, is a recipe for a successful 2017 stock market. With the stock market showing no signs of slowing down, it only stands to reason that Wall Street bonuses will be increasing as well. “Goldman Sachs (GS) set aside $3.21 billion in the third quarter for salaries, benefits and expected bonuses for its employees. That’s 36% more than how much it set aside in the same period a year ago.” (http://money.cnn.com/2016/10/18/investing/goldman-sachs-bonuses-compensation-earnings/) This is a clear indication that many of these financial advisors, analysts, executives, and share holders will now have increased disposable income to invest in secondary properties here at The Jersey Shore. This information is vital in trying to determine what the 2017 real estate market will look like. Let’s take the premiere luxury Jersey Shore real estate communities of Mantoloking and Bay Head New Jersey. Mantoloking is made up of 70% white collar workers with 58.4% of the workers coming from the Finance, Insurance, Real Estate, and Services Industries. Bay Head is comprised of 61% white collar workers and 48.24% are in the Finance, Insurance, Real Estate, and Services Industries. http://mls.realist.com/index.jsp). This is why the stock market surge and the Financial Services bonuses are excellent indications into 2017 being an outstanding opportunity to sell property here at The Jersey Shore. Selling secondary properties will trigger a “taxable event” and realizing that timing and planning are the two strongest ways to potentially minimize that liability, can alleviate that burden. One way to defer those taxes on any potential gains is through a 1031 Exchange. This basically involves the selling of investment property and reinvesting the proceeds into a “like kind” asset. By doing so, you are deferring the taxes that would normally be due to the U.S Government. As with most things in life timing is important. The way I see it, getting a property on the market early in the year is crucial to maximizing your options as to what to do with any potential profit. The benefits are low inventory, more serious buyers, and time. After you are listed if a property comes on the market and attempts to compete with you on price you can do a price adjustment. This benefits you because that new property typically doesn’t have that luxury. Now let’s assume that the property is listed in January and relatively soon after receives an expectable offer. We go through all the necessary process and close the transaction in early March. If a 1031 Exchange is not the avenue that would benefit you the most, than any gains that are acquired through the sale could be reinvested into some other vehicle and potentially earn a higher yield. In conclusion, I believe that the incoming President Elect and his background will keep the Wall Street population moving in a bullish direction and, in turn, put larger bonuses in the pockets of those who are in the Finance, Insurance, and Real Estate Industries. This will benefit The Jersey Shore real estate market because of the added discretionary income and the desire to be a part of the elite who already live in these shore towns. As a result, getting your property listed as early as possible will ensure you the opportunity to showcase it first and be at the forefront of the market. Please contact Jeffrey Roberts to discuss a personalized comparative market analysis and for macro conditions concerning your local market. With the winter months slowly creeping up on us, it’s time to say hello to colder temperatures outside and face the not so friendly realities of the higher temperatures needed inside. 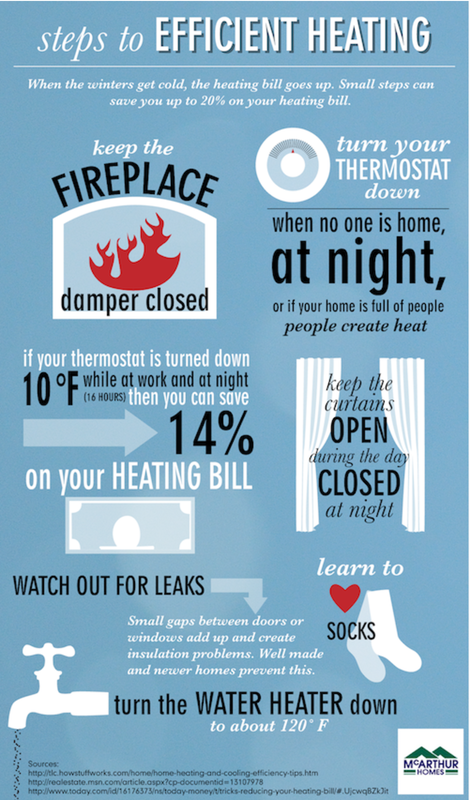 As painful as that first heating bill can be, there are a few things homeowners can do to ease the sting just a bit! As nice as it is, to cozy up in front of the fire during the winter months, it is important to remember that when the fireplace isn’t being used, that chimney is a big source of cold air into the house. Be sure to keep the fireplace damper closed when it’s not in use. As much as we like to keep the thermostat at a nice standard temperature when the outside gets chilly, sometimes it is okay to turn it down a few notches. If you leave the house for a night out with friends, or even a weekend trip-turn the thermostat down before you go. This will bring the temperature down in the house, but with no one home, why not? Or on the other hand, maybe you’re having the fun come to you by throwing a party of your own? Do not assume that you have to turn the thermostat up to make the guests comfortable, rather turn it down a bit once they arrive. People create heat, so keep everyone from getting too warm – and save a little too! Sometimes we forget how beneficial the outside can be, when we escape into our homes for the winter months. However, the windows can have a big effect on how our house maintains its temperature. Keep the curtains open during the day, in order to allow that sun to shine in and provide some natural heat to the home. Then at night, close them up to try and keep any drafts from the windows under control. If your thermostat is turned down 10 °F while at work and at night (16 hours) then you can save 14% on your heating bill. Although this trick may seem a little crazy, and certainly not practical for every household, it does lead to some pretty significant savings. For those who are able to let that thermostat drop while the house is empty during the day, and then pile on the blankets at night, it may very well be worth the 14% savings on the monthly heating bill. Watch out for leaks- small gaps between doors or windows add up and create insulation problems. Well-made and newer homes prevent this. Although it may be hard to seal up every nook and cranny (especially those that come with the charm of older homes), insulation strips can be purchased to try and minimize the warm air leaks. You certainly do not want your heat kicking on, to have half of it go to waste. The hot water heater is a source of heat that we sometimes tend to overlook. If we turn the set temperature down to about 120°F, then you can still maintain some very hot water for all household needs, while keeping the amount of heat used in reason. As silly as this sounds, socks are a great go-to, to keep the most body warmth in you as possible! Not to mention, non-carpeted floors can get pretty chilly with or without a heated home. So as the cold winter months’ creep up closer and closer, remember these tips as the key to a warm and cozy, yet affordable, season in your home! It’s that time of year again! “Santa Comes to Town” has come to Arnold Ave! Sponsored by CARA Realtors, this holiday event brings the spirit of Christmas and cheer to Point Pleasant Beach. This year was nothing short of a great experience for everyone who came out to celebrate the season. CARA Realtors even raffled off bikes to 6 lucky winners! Be sure to follow us on Facebook and Instagram to keep up with our future events!